Close your eyes and imagine the floor beneath your feet—cool hardwood maybe. Or softly warm and carpeted. Sit down and lift your feet up off of it and imagine you can never put them down on it again. Ever. See how quickly the feeling of the floor fades? See how much you want to feel it again? How lost you feel with no place to put your feet? It’s okay to put your feet back down on it. Maybe in your lifetime that floor’s not going anywhere. Evie, the first-person narrator of Hush, can no longer put her feet down on the floor—or at least that’s how it feels to her. Her family has moved from Denver to an unnamed city, leaving behind not just their home, but also their friends, extended family, and even their names. Forever. It was the only way they could stay safe. Evie’s father, the only black cop on the Denver police force, saw two colleagues shoot a black teenager without provocation. Furious at the injustice and saddened by the prejudice behind it, he chose to testify against the two officers, and that choice left him at odds with many of his colleagues and former friends and put his family in danger. Now Evie, formerly Toswiah, has a new name and, it appears, a new family. Her popular cheerleader sister Cameron, now known as Anna, is prone to tearful outbursts. Her mother has become a committed Jehovah’s Witness and no longer allows the family to enjoy familiar birthday and holiday rituals. Perhaps the most upsetting change is in Evie’s father who has not only lost his name but his identity as a cop. This shooting brought his two identities—as a cop and a black man—into conflict. To protect one was to betray the other. Now, having brought his family to a safe new home, he sits in a rocking chair, deep in depression. Some mornings, waking up in this new place, I don’t know where I am. The apartment is tiny. The kitchen is not even a whole room away from the living room, just a few steps and a wide doorway with no door separating it. Not even one fireplace. Daddy sits by the window staring out, hardly ever saying anything. Maybe he thinks if he looks long and hard enough, Denver will reappear, that the cluttered corner store filled with canned stuff, racks and racks of junk food, beer and cigarettes will morph into the hundred-year-old cedar tree at the end of our old street. Maybe he thinks the tall gray buildings all smashed against each other will separate and squat down, that the Rocky Mountains will rise up behind them. I want to say Daddy, it’s never gonna happen. But I’m afraid he’ll break into a million pieces if I do. Become the skin-dust floating around the room. I want to say Daddy, you did the right thing. My only complaint is that there were a few points when it wasn’t clear to me whether an incident took place in Toswiah’s old life in Denver or in her new life as Evie. Early on in the book, it appears that the most of the memories will appear in short passages between the chapters or that there will be clear transitions into the memories within the chapters, so when some of the memories of the past are used to launch new chapters, I was confused. Woodson makes Toswiah/Evie’s age clear during these transitions, but somehow I missed whatever early indications there were of Evie’s age when the family moved, so those signposts weren’t of much help. This didn’t really detract from my enjoyment of the book, but it did leave me puzzled and flipping back in the book for clarification more than once. Those who assume young adult fiction is merely about good story-telling would do well to check out this book. At only 180 pages, it’s a quick read, but Woodson has a voice and prose style that easily rivals—and perhaps exceeds—that of many well-known literary fiction authors. 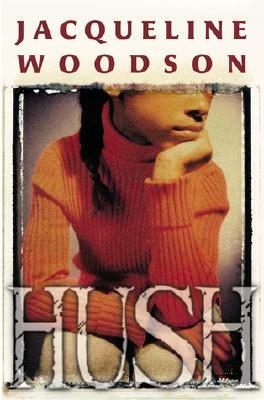 I’m curious as to how Hush compares with the rest of Woodson’s work, and I’d love for those of you who’ve read her other books to share your recommendations! Last year I read Locomotion and Peace, Locomotion by Woodson and have loved her writing ever since. Locomotion made me cry so hard and it is better than Peace, Locomotion. I’ve read nothing but great reviews about everything Woodson has written. Besides the two Locomotion books what about After Tupac and D Foster? It won a Newbery Honor award. Vasilly: Thanks for the suggestions! I know my library has After Tupac and D Foster, but I’ll look for the others as well. I haven’t read it or even heard of it, but it sounds intriguing. Only thing is, it also sounds rather depressing. Is it a very sad book – do things pick up? Litlove: Despite the sadness of the situation (and it takes one darker turn toward the end), the ending is surprisingly uplifting. I’ve read two of her books so far (Miracle’s Boys and If You Come Softly), and like you I was very impressed with the writing. Also with the fact that she manages to make such short books feel so powerful and complete. I’m glad to hear her other books are well written, Ana. And you’re right about her ability to pack a lot into a short book. I have this one on my shelf. It sounds pretty good. Jeane: I hope you enjoy it! I’ve not read anything by Jacqueline Woodson yet, though I keep intending to check out her books at the library. Nobody seems to have a negative word to say about her! After reading If You Come Softly, I am willing to try anything by Woodson. Thank you for a great review. Kathleen: I’ll keep my eyes out for If You Come Softly. Sounds like a really interesting book–I like the premise, and the parts you quoted are compelling (I love “lush” prose). Time shift books are always challenging but I usually end up liking the result–that balance between then and now intrigues me. Good review. Jane: I enjoyed it a great deal, particularly for the writing, which is why I shared so much of it! I don’t expect to find such lyrical prose in YA literature (which probably says more about my own misconceptions regarding YA than about YA itself).